BAH Note: I searched and googled but couldn’t find any reference to Bockers online. The best explanation I could get from The Mistah is that they were fried dough treats. What’s not to like about that? As a special surprise, I made these for breakfast on our anniversary. You’ll definitely want to have more than two people on hand to gobble up these fried doughy treats. We went with a cinnamon/sugar coating on the doughnuts, and spread Nutella on the centers. I don’t think there’s a wrong topping for these so you use what you like best. As far as cooking times go, they were light golden brown after about two minutes but were still doughy inside. I recommend making a test doughnut to see how long you should cook yours….there’s no calories in a test doughnut anyway. Flatten out your biscuits like pancakes then poke a quarter sized hole in the middle (a small biscuit cutter does a great job). Heat vegetable oil in a 2 quart saucepan over medium heat. You will want the oil to reach approximately 350 degrees. Working with one or two doughnuts at a time, fry them on both sides until golden brown. Use something like a bamboo skewer or chopstick to safely and easily flip the doughnuts in the oil and to remove them when done cooking. Dust with powdered sugar or make a quick glaze with the powdered sugar and milk. Serve warm. These look like cake donuts…had a couple of those this weekend from the bakery around the corner. Sweets are evil, but so good. 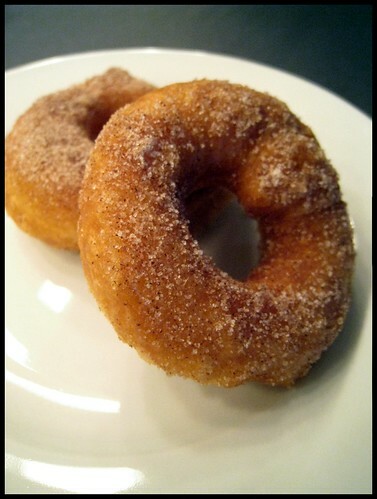 But seriously, cake doughnuts are so easy to make from scratch, Wendi you should experiment! Mastering the art of homemade doughnuts would not be good for our waist lines. But I’m sure they would taste sublime. Mouth is watering. Homer sounds escaping. No longer wonders why waistline is expanding. Does anything say I Love You more than deep fried dough smothered in sugar?